RCM Robinson Capital Management LLC is an investment advisory firm registered with the Securities Exchange Commission that specializes in treasury funds management and the healthcare and supplemental pension trust investment management needs of local government agencies and municipalities. Clients include cities, counties, redevelopment agencies, special districts, and water districts. Serving families, trusts and foundations as well. Since 1982, Founder and President, Douglas C. Robinson has served the investment needs of institutional and private investors. Doug is a long-time member of the California Municipal Treasurers Association and frequent guest speaker for the California Society of Municipal Finance Officers, California Special District Association, California League of Cities, International Public Management Association, and local government council and investment boards. 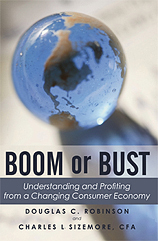 Doug received his Bachelors of Science degree in Economics from University of Missouri-Columbia and is co-author of , "Boom or Bust: Understanding and Profiting from a Changing Consumer Economy." Between 2015-2019 Doug served as a board member of the California State Treasurer's Office, Local Investment Advisor Board (LIAB), which provides oversight to the Local Agency Investment Fund (LAIF). � Check the background of this firm on FINRA's BrokerCheck. � Check the background of this investment professional on FINRA's BrokerCheck. Advisory services offered through RCM Robinson Capital Management LLC, SEC Registered Investment Advisor. Securities offered through Securities America, Inc, Member FINRA/SIPC. Douglas C. Robinson, Registered Representative, CA Insurance License #0A14579. RCM Robinson Capital Management LLC and Securities America, Inc. are separate and unaffiliated.